Excellent article in the NYT looking at the enormous and ever increasing global threat of antibiotic resistance. 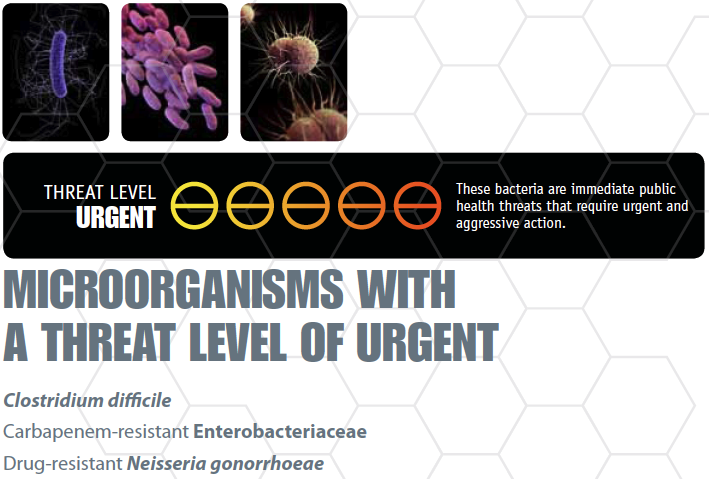 Below is a graphic from the 2013 CDC report on the three organisms whose antibiotic resistance is designated at an urgent threat level in the US; Clostridium difficile, carbapenem-resistant Enterobacteriaceae and drug-resistant Neiserra gonerrhoeae. I am a Phd holder from the below address who researches and teaches at one of the youngest Universities in Nigeria. My area of research since I bagged my Phd in 2014 is on epidemiology of antibiotic resistance bacteria and genes from drinking water. From my online search, I observed you have done a lot of work in this area. And is even the focus of your research group. I therefore decided to seek you permission in hosting me in your lab as a post doctoral fellow. I am presently interested in whole genome sequencing comparison between antibiotic resistance genes of bacteria from environment, agricultural/food products (food borne pathogens) and clinical sources in Nigeria or epidemiology of MRSA from Nigeria. This will be of great international collaboration to you and your center. In-fact, we can even compare it with strains you have been working with in your lab. I was in Call lab at, Paul G. Allen School for Global Animal Health, Washington State University, USA for six month during my Phd as a visiting research scholar, there I was able to gain a lot of international experience into research into molecular characterization of antibiotic resistance bacteria using different techniques. I will send my proposal and CV if you agree to host me in your lab. I am pretty sure the proposal will interest you. I will be glad if my request is granted.